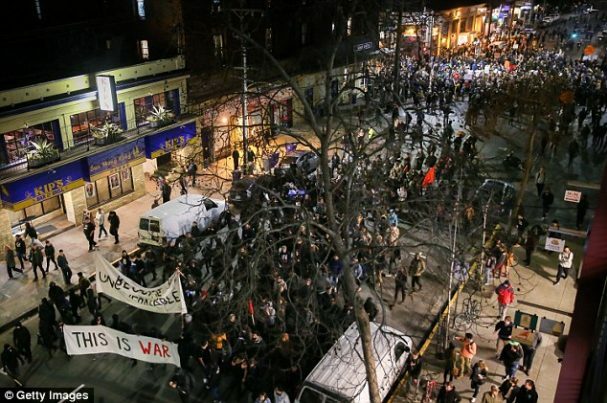 Despite the cancellation of the “Free Speech Week,” which was allegedly going to star Milo Yiannopoulos, Ann Coulter, and Steve Bannon, a bunch of social justice activists converged on Berkeley to protest anyhow. So YouTube personality Fleccas, real name Austen Fletcher, arrived on the scene to learn firsthand what all those outraged activists were specifically protesting. By the end of the day, Fletcher came to the conclusion that a vast majority of them don’t really know and even fewer are able to defend their incoherent political positions. “Stop laughing at her!” yells another protester to someone who apparently couldn’t hold in a few laughs at the over-the-top accusations. The first guy Fletcher interviews accuses the police, who are there trying to keep order, of “promoting hate speech,” despite the fact that the “fascist” free speech rally was actually cancelled. After assertively declaring that she does not agree with President Trump’s views, a female protester wearing white sunglasses can’t seem to remember a single thing he’s said that she disagrees with exactly. “I think he’s just…” she begins, then shrugs. “I can’t pick out a quote in particular…” she says. After a pause, the anti-fascist says, “I would argue the Black Panthers are way better than the KKK or any white supremacist.” He goes on to estimate that a “large amount” of Trump’s base is the KKK. By the end of the video it’s abundantly clear that a whole lot of the leftist activists believe that subjectively defined “hate speech” is not protected by the Constitution, uncritically believe wild, unfounded accusations about basically everyone on the Right, and ultimately don’t really know what they’re angry about.